Brown wingbacks (lobby): Mitchell Gold + Bob Williams through ABC Carpet & Home. White wingback frames: Artistic Frame. Slipper-chair fabric: Designtex. Lamps: Judi’s Lamp Shades through ABC Carpet & Home. Custom side tables: Barrett Hill. 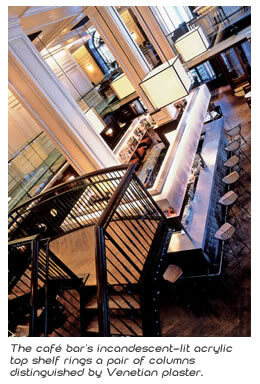 Custom railing (lobby), custom wall (wine room): J.F. Graney Metal Design. Custom sofas, slipper chairs (lobby), custom armchairs (bar): Chair Choice. White wingback upholstery (lobby), bar upholstery, sofa upholstery (café): Mix Industries. Chandeliers (main dining): Schonbek through Ruth Drachler Co. Custom chandelier shades, sconces (main dining, café): Laspec Industries. 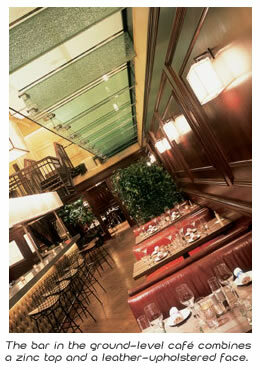 Pendant fixtures (lobby): through Creative Lighting Supply; Material Process Systems (custom shades). Column upholstering: AVS. Stenciling: Asterisk Designs. Bar stools (café): Knoll; Cortina Leathers (upholstery). Flooring, stair treads: Wide Plank International. Custom banquettes (café, champagne lounge): Munrod Interior Upholstery. 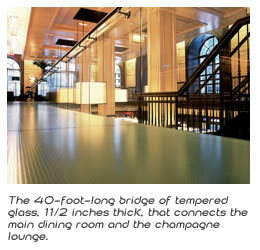 Lamps (champagne lounge): Flos through Design Within Reach. Metalwork, glasswork: Architectural Metal Fabricators. Conservation consultant: Building Conservation Associates. General contractor: Shawmut Design and Construction.